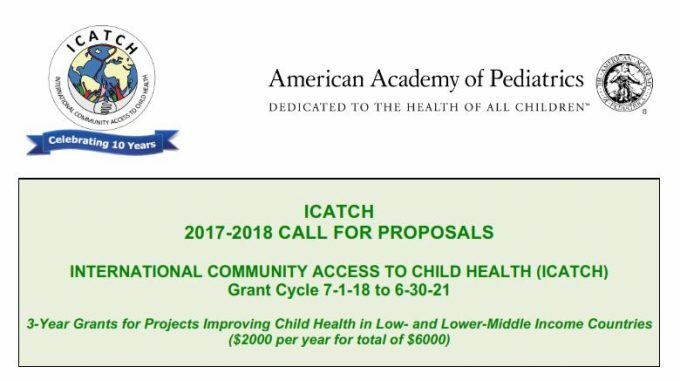 The International Community Access to Child Health (ICATCH) program is a grant program of the American Academy of Pediatrics (AAP) Section on International Child Health (SOICH). ICATCH grants are designed for pediatricians and other health workers in low- and lower-middle income countries who need financial and advisory support to plan and implement a project or program that improves child health, or increases children’s access to health care. Funding for proposals selected in this grant cycle will be available by July 1, 2018 and conclude in June 2021. An important requirement is that projects establish or continue collaboration with one or more community partners such as local nongovernmental organizations, local governments, schools, faith- based groups or local businesses. Such collaborative partnerships help insure sustainability of the project beyond the 3-year grant period, which is encouraged and expected. The idea for the project or program should originate from the community where it will take place. We do not fund proposals where those leading the initiative are not directly involved and invested in the target community. ICATCH will consider for funding any community-based project or program that will improve the health of children and their families, or increase children’s access to health care services. Such programs could involve (but are not limited to) primary care, oral health care, mental health care, nutrition services, rehabilitation services, injury prevention and safety, services for children with special needs, the education of health workers or patients or families, etc. ICATCH funding CANNOT be used for research projects. Funded are health care services for children, activities that increase access to health services, or training that improves existing services for children. We do allow a portion of an ICATCH project’s budget to be used for monitoring and evaluation activities, which are encouraged. The idea for the project or program should originate from the community where it will take place. We DO NOT accept applications where those leading the initiative are not directly involved and invested in the target community. A Project Director and a Project Co-Director MUST be listed on the proposal. The Project Director must live and work near the community where the services/training will be offered. A portion of the ICATCH grant can be used for project-related planning (maximum planning period is the first 6 months); however, project service or training activities MUST begin after the first 6 months (i.e. by end of December 2018). Project Directors and Co-Project Directors need NOT be pediatricians—applications can come from other medical doctors, surgeons, nurses, midwives, health workers, social workers, dentists, physical therapists or anyone who provides health care or health education for children and youth. Fit with the ICATCH mission of helping local health workers or educators improve child health in their communities using collaboration with other community agencies or resources. The potential of the project to make a difference in the health and well-being of children in the local community. 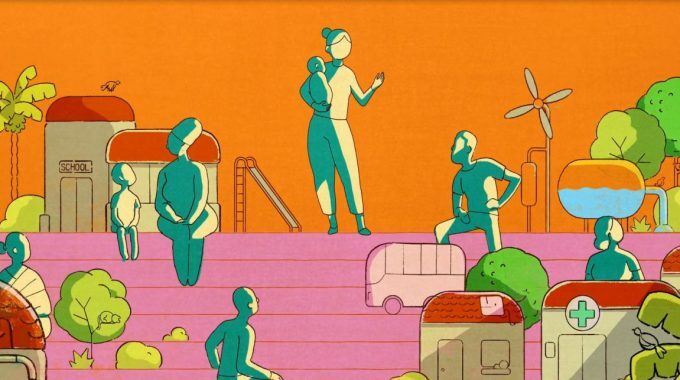 The project’s potential for sustainability beyond the 3-grant cycle, and the potential for scale up or replication in other communities to impact more children and families. How clearly the project goals and activities are described in the abstract and in the answers to application questions. Funding: ICATCH will provide financial support up to a maximum of $6000 over a three-year period. Funds are distributed as a maximum of $2000 per year. At the end of each year, recipients must provide a brief annual report of the project or program in order to receive funds for the following year. 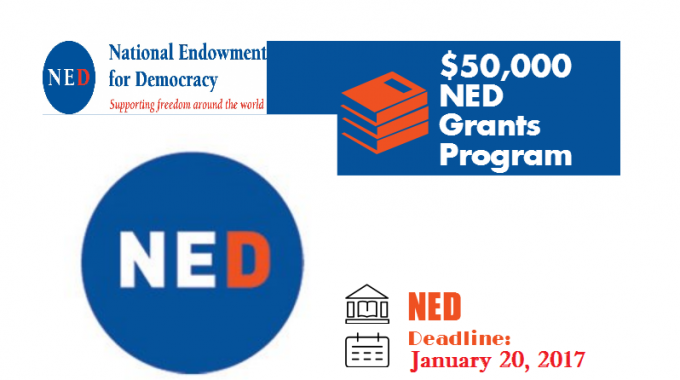 Funding for Year 1 of this cycle will be awarded in June 2018. Peer Support and Collaboration Opportunities: If desired, grant recipients can be linked with a pediatrician Project Advisor in the AAP with experience in global child health and, if possible, with specific experience related to the type project. This partnership could facilitate exchange of ideas and the opportunity to share successes and lessons learned in implementing specific activities. Preliminary Application Forms should be submitted to icatch@aap.org no later than 28th November 2017. All received Preliminary Application Forms will be reviewed and a certain number of these submissions invited to apply for funding (by completing a more detailed ICATCH APPLICATION). The deadline for PRELIMINARY APPLICATION FORMS is November 28, 2017.